It was 3:15 in the morning. I stared at the unfinished Project report on my laptop screen. I had gotten a little irksome over the last one hour, formatting and editing the final draft of the most important project of the term. The submission deadline was just round the corner. In about three hours’ time I was to board the bus to Tumung. My whole class would be with me too. 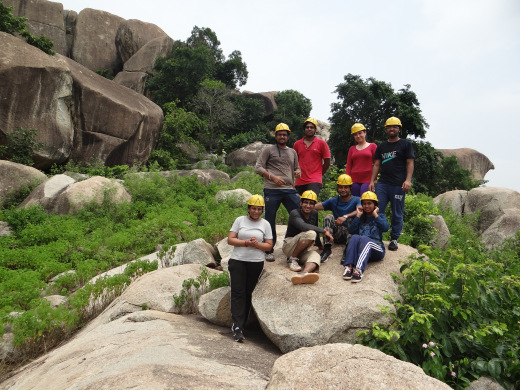 The three-day Outbound Programme conducted by TSAF was about to begin for our class of sixty. This programme was on top of my to-do list ever since I joined XLRI ten weeks back. Not academics, not assignments, not Internship interviews, not CV preparation- but this! That’s me. I took a break to have a chat with the only project teammate who was not asleep yet. 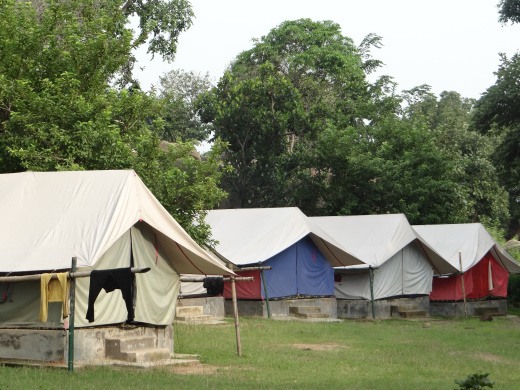 The other three were tucked in the cosy beds in their hostel rooms. We decided, come what may, let’s finish this up in an hour’s time. After the usual round of drama in MS Word where words and blank spaces behave like always-at-war siblings, I managed to bring them to line. I hit the Submit button finally at 4:15 am. We were smiling finally, after hours of backbreaking (MS Word and Excel) work. MBA and Word-Excel-PowerPoint have been married since eternity, you see. I stepped out of my friend’s room. I hurriedly paced to my room on the floor above, to finally start packing for the trip. I had two hours before I could take a nap, pack, freshen up and finally join my friends for a three day retreat. The checklist email from Dean’s Office came in handy. I dumped in random order, all my stuff into the backpack. It sure resembled the bag of one of those madmen we see on the streets- just that my bag must seem like a richer cousin of theirs. 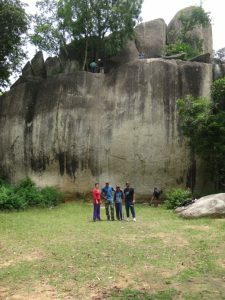 Camera, shoes, tees, trousers, torchlight, mosquito repellent, phone charger and a load of snacks were the high-priority items to carry. All set finally, it was time for a nap at 5:00 am with an alarm set at 5:30. So, I got to sleep for two thirty minute durations in the past 48 hours. My brain was behaving as if Angry Birds had been installed in a Windows 98 Operating System- crazily malfunctioning that is. I zombied my way through the walk till the bus at the other end of the campus. It was 6:15 and already most of the class had assembled there. Each one was discussing their last night out for the project report submission. A few excited voices were mentioning that they submitted theirs just 15 minutes back, clearly the standout daredevils they were. Well anyways what lied ahead of us slowly grew upon us as we divided ourselves into two buses. For some strange reason even the dilapidated bus was as much in demand as its dapper shiny brother. We started to join in the early morning deserted streets of Jamshedpur- enjoying the cool breeze and warm sun. And the impromptu karaoke sessions begun amid light-hearted banter. I bet a bunch of prisoners out on parole for three days, escaping the excruciatingly tough life of prison would not have been any happier than us. I drifted to sleep along the ride even as my friends crooned at their melodious and ridiculous best. When the time came to get down from bus at Tumung, I struggled to pull myself out of my seat. My limbs would not budge, my back was stuck in a Fevicol embrace to the backrest of the seat and my eyes- oh boy! I felt as if my upper eyelids were tied down by thousand kilo weights and only an Olympic gold medallist weightlifter could lift those heavyset eyelids of mine. That struggle of a couple of minutes to open my eyes was the most epic battle I have fought with my eyelids in my entire lifetime. I swear, man. And then it started. 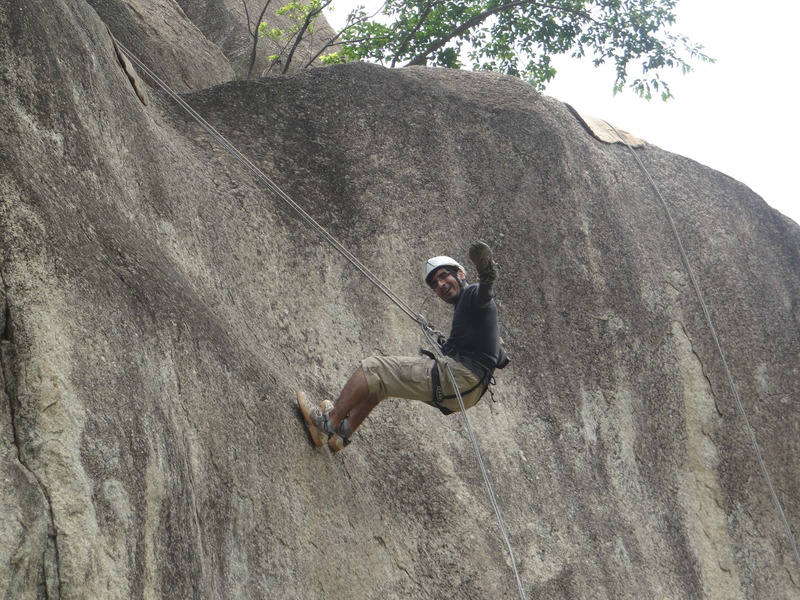 First we were introduced to our camp instructors- all adventure junkies with enviable experiences. Next we were all divided into eight groups each comprising seven to eight members. This was the group we were supposed to stick to- through thick and thin over the next three days in our quest for accomplishing all the tasks and activities. There were a number of things we did and most of them for the first time in our lives. We finished Obstacle races which had eight components of varying degrees of difficulties. We walked, sprinted, climbed, jumped or crawled over combinations of ropes, tyres, barbed wires, rocky paths and muddy pools to finish them all on time. As I caught my breath for a while, my aching body reminded me of all the unkept self-promises that I had made over the past few years of hitting the gym regularly. I think God has a way of getting back at you for not being regular in the gym. The other activities that were packed into the schedule were aimed at testing and assessing our memory skills, leadership styles and out of box thinking. They were fun. They relaxed the body and activated the grey cells as far as they could. Just that sleepless zombies like us respond to nothing but sleep which we got not in the afternoon but much later in the night. In the small breaks, as we finished our tasks, I observed many among us catching sleep even as they were standing or backed up against a rock or simply passed out on the lawn. It was as if all of us were crying out loud that sleep be included as a Fundamental Human Right in the next Amendment to the Constitution. Camping in the outdoors in tent houses was a first for me. I even learnt to pitch a roomy tent for six persons from ground up. Living without power, away from the constant buzz of WhatsApp and swapping mosquitoes with our bare hands made many of us wonder- were we in the dark ages of the cavemen! All of it seemed tough not because it was actually tough, rather it was our resistance to the change from a luxury-based life to a nature-based life. Fair enough. We are inner-wired to adaptation fortunately. And we responded accordingly- learning to enjoy the company of each other. Sleep deprived that we were, most of us were asleep by 9:30 pm- an unthinkable action and a blasphemy actually back in our institute hostel. In the two days I was at Tumung, I was thrilled beyond measure. The cave exploration, abseiling and rope gliding experiences have left a strong aftertaste for adventure that will take a lifetime to satiate. My arms outstretched wide, my legs dangling in the empty air, my waist tightened with a safety belt to the rope- I realized that my life that was barely clinging to my body a few seconds ago was back in its place safe and sound. It was perhaps only the reassuring cheers and hoots and whistles of well-meaning friends that saved me from dying of an imploding heart or something of that sort. And that was it. That one thrilling experience. That was when, for one brief moment I became the Flying Fox. One step more. 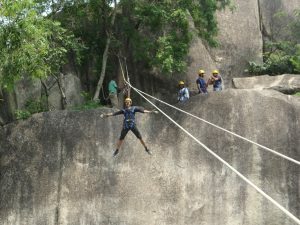 One single step backward, before I slide down, vertically from sixty feet above to the ground. 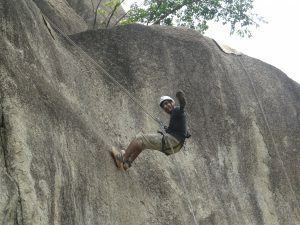 My right hand holding on to the guiding rope, my left hand trying to figure out the braking mechanism, my upper body straight as a ramrod aligned perpendicularly to my lower half which took support on the rock surface- and I imagined what if the rope came undone and I fall with a thud. I shut my eyes close, took one deep breath, and clenched my fists and teeth before I let myself loose. Next moment I looked up to the bright blue sky, the silhouette of trees and the hovering birds- all forming a perfect backdrop to the vertical rock mass from which I was descending. My pounding heart, my shaky feet, my jittery thoughts from a while ago had all subsided as I touched the ground. That was it. Another thrilling experience. 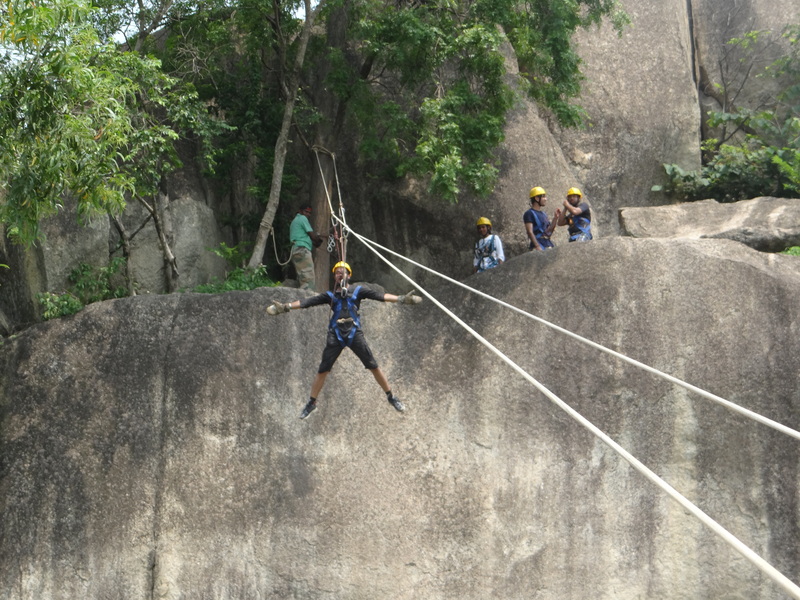 And in matter of few seconds I had become an amateur abseiler. 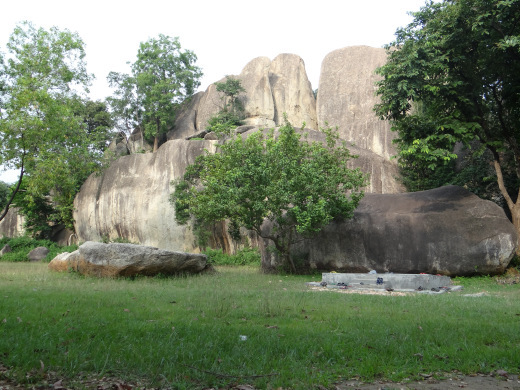 The rocky hills at a distance held a certain allure ever since we landed at Tumung on Friday. By Saturday we could not ignore it any longer. It was time to explore the unexplored. From what we had heard, there were caves, as dark and as small as they could get. There were rocky walls- as steep and as slippery as they could be. And of course inside there were water pools- as dirty and as slushy they could get. All of us were geared up to brave them, come what may. And boy did we do it, that too in style. Did I say “in style”? You bet, I said that! 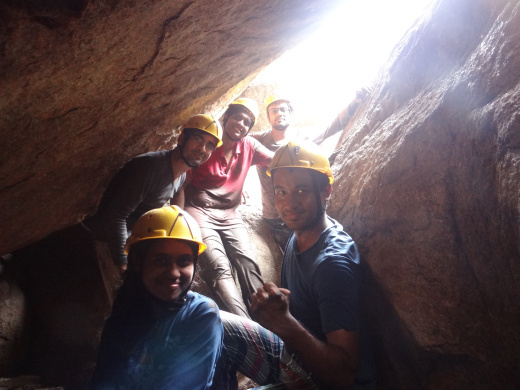 Here is the proof: in the couple of hours that it took our team of eight including our terrific instructor KK to cover/ traverse the caves, we clicked hundred odd photos inside the caves. Our pictures came in all sizes and shapes- crawling, jumping, climbing and crouching. Our pictures came in all situations and places- in mud pools, in dark corners, in open spaces and next to boulders and trees. What pains we took to ensure every single moment was captured on the camera. For posterity. 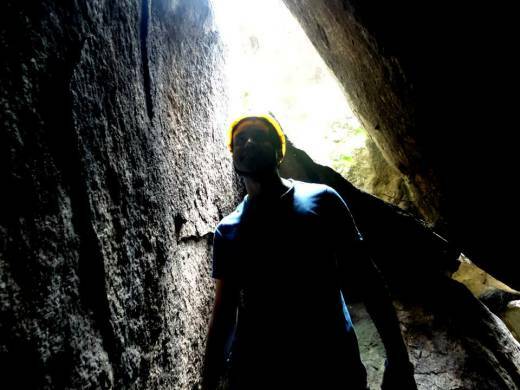 Decades hence, when we look back to this experience of exploring caves in the hills of Tumung, it is these pictures that shall serve to remind us of the good times we had. 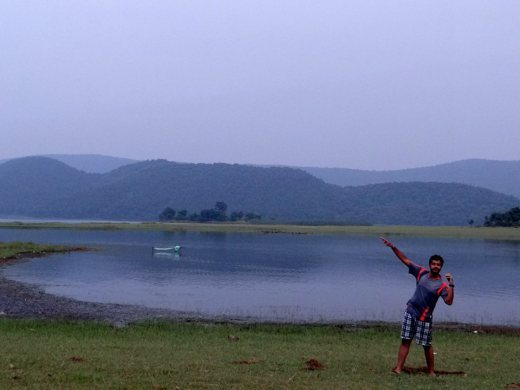 On the third day, we moved closer to Jamshedpur to Dimna Lake for our final round of adventure sports in water. 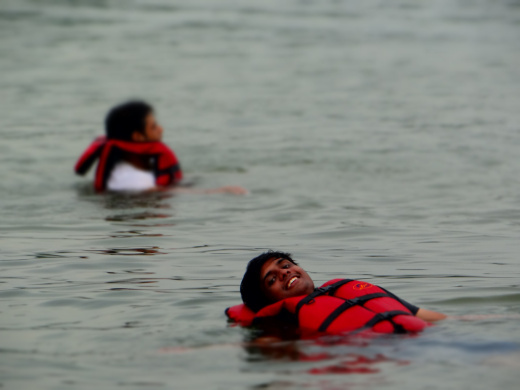 Put on a life jacket. Hop on to the raft. Hold on to the oar. 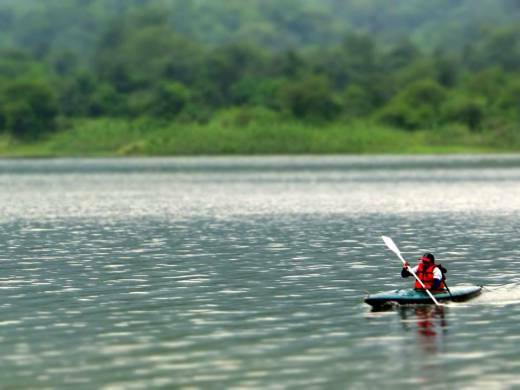 And paddle across the lake to the chants of “Together. Row.” There were two raft races. One an improvised raft made of empty plastic drums, bamboo sticks and ropes. Another on a prebuilt raft made of tubes. Aching arms and tired legs were no match to the soaring spirits of the groups as we competed to give our best. Get into the water. Hold on tight to the plank as it starts to inch forward- slowly at first. 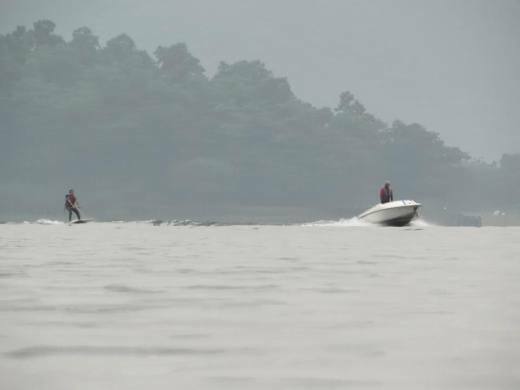 As the speedboat accelerates taking along with it the wooden plank that is tied to it through a long rope, position your knees on the plank. Gradually lift your lower half of the body with straight knees even as you hold the plank. Then as the speedboat throttles to full speed steady your stance holding on to the dangling stick-and-rope handle and stand upright. Feel the water waves crashing on your feet, feel the wind blowing on your face and feel the magic of walking on water. In those thrilling moments I felt myself zoned out into a calm serene state. And I lost count of time as I skurfed for the first time ever in my life. Through the course of the day, the harsh sun took a retreat as dark clouds hovered over the green hills that stood at the banks of the lake. Exquisite with a capital-E. Everywhere I looked around me, it was precisely that. I was on a picture-snapping spree there. Such beauty could be captured only to a certain extent. I doubt if views as lovely as those could ever be reproduced accurately through the camera lens. You only have to be there right in the middle of that place to know what effect it had. To the writer inside me, my solitude-seeking self, raised its opportune head. I desired nothing then as much as to spend a quiet few days there in the lap of nature all alone and write to my heart’s content. Only thing was I had to get back to writing my end term examinations in a couple of weeks. So much for the desire to write. In doing all of these, in experiencing each of them- I am neither the first, nor the last one ever; I am neither the youngest nor the oldest one ever; I am neither the fastest nor the coolest one ever. No, I am not any of those. But having been there, done that, I claim for myself the thrill, the adventure, the sheer purity of the rush of adrenaline. And that is what I believe is the biggest takeaway from doing what I had never done before. And of course there were the stronger bonds of friendship which were fostered over the period of three days. In trying to give our best performance, looking out for one other, we returned a much stronger and cohesive group of classmates. that exist as of yet only in the future.